Learn from 28 years experience in drumset and world percussion. Reid is a degreed percussionist BM-Percussion Performance -CSUN 1997 with International touring experience, a recording artist with 5 CDs The Sacred Language, producer, recording engineer, instrument designer and builder. DeFever Drum Company and founder/director of D.H.A.R.M.A. ensemble. SKYPE Online Video Lessons!! study with a master in your own living room!! 2 Drumsets in studio = more playing time. + Record your lesson!! Not sure if your son or daughter will stick with it? try No Drumset Required out for starters. Reid DeFever teaches private and group drum lesson throughout Southern California including: Los Angeles, Culver City, Santa Monica, Ojai, Ventura, Santa Paula, Camrillo, Oxnard and Thousand Oaks. You will not find a better drum set or hand percussion instructor. Reid has taught for 20 years ages 4 though 60, it is never too late or early to learn! Reid is an active performing drumset and percussion player in Los Angeles as well as International scene so you will be learning from a professional. Lessons range from simple fun enthusiast to the serious college music school and professional performance level. Lessons are always at your pace. Along with performing with several projects including his own solo project The Sacred Language, leads drumming intensive workshops and drum building workshops in Costa Rica, New Zealand and Sedona with DrumTour. Reid provides hand drumming and drumset lessons in Culver City, Santa Monica, Huntington Beach, Pacific Palisades, Beverly Hills, Ojai, Ventura, Santa Paula, Camarillo, Oxnard, Thousand Oaks and surrounding communities. Wolrd percussion often referred to as hand drumming is a wonderful gateway to personal growth, creativity with an added bonis of exploring other cultures and their music. Reid not only teaches the above listed instruments, he performs with them so you will learn from a professional! 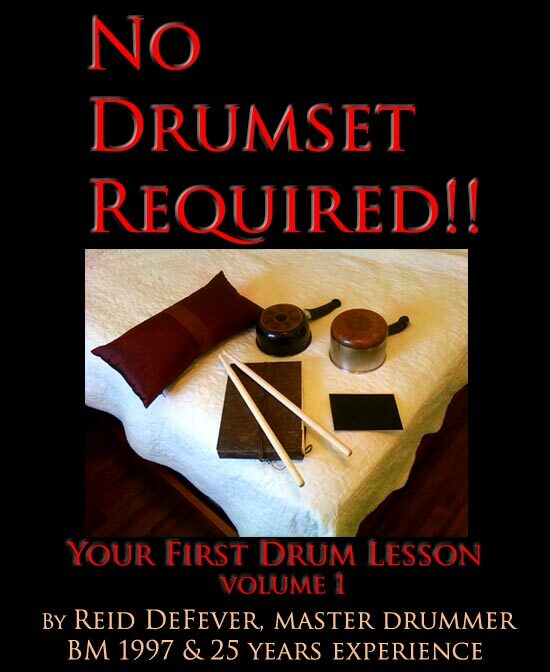 Learn to drum: djembe, doumbek, tabla, taiko, cajon, congas, bongos, timbales, timpani, marimba, and drumset: all styles! Want to build your own drums? Reid has drum building workshops! making your own custom Tabla, Taiko, and Cajonbeks!